Pulls you to the enemy instead. Grants Empower after being pulled. If the target cannot be pulled, you are refunded the Magicka cost. Fiery Grip: Launch a fiery chain to grasp and pull an enemy to you, dealing [3074 / 3106 / 3140 / 3175] Flame Damage. Grants Major Expedition, increasing your Movement Speed by 30% for 4 seconds. This attack cannot be dodged or reflected. Empowering Chains: Launch a fiery chain to grasp and pull you to an enemy, dealing [3180 / 3216 / 3249 / 3285] Flame Damage and granting you 2 uses of Empower, increasing the damage of your next 2 Light Attacks by 40%. Grants Major Expedition, increasing your Movement Speed by 30% for 4 seconds. This attack cannot be dodged or reflected. 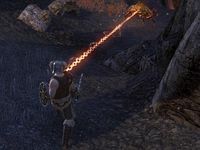 Unrelenting Grip: Launch a fiery chain to grasp and pull an enemy to you, dealing [3180 / 3216 / 3249 / 3285] Flame Damage. Grants Major Expedition, increasing your Movement Speed by 30% for 4 seconds. If the target cannot be pulled, you restore 100% of the ability's cost as Magicka. This attack cannot be dodged or reflected. Fiery Grip deals fire damage and pulls the target of the attack towards you, and also increases your Movement Speed for a few seconds. This can be useful for getting close to ranged enemies who generally try to attack from a distance. It can also be used to pull a single enemy out of a group and deal with them individually. With a little luck and careful judgement of distance, you can sometimes do this without alerting the whole group, allowing you to deal with them one at a time. The Empowering Chains morph will pull you to the enemy instead and grants you Major Empower, increasing the damage of your next attack. Or you can choose Unrelenting Grip, which will refund its casting cost if the enemy cannot be pulled. It still deals the Fire Damage if this occurs, at zero cost, so it can be a cheap (if not very powerful) fire attack on immovable enemies. The target is knocked down or immobilized by another attack. The target has recently been moved by another player also using Fiery Grip. The target is charging up a Heavy Attack. Most boss level enemies cannot be pulled. Some targets are always immobile, e.g. Stranglers. With the Unrelenting Grip morph, you will be refunded the Magicka cost if the target cannot be pulled. Using this ability around other players can cause confusion or even annoyance. As a matter of etiquette, it's probably best to avoid using it on a target who is already engaged with another player, unless they appear to be in need of a rescue. Unrelenting Grip was added in Update 9, replacing Extended Chain, which increased the range and reduced the cost. Unrelenting Grip is a recommended morph for the Dragonknight Initiate build. This ability will no longer taunt monsters that already have an active taunt on them. Revised the terrain around all keeps to reduce the potential for pulling an enemy friend onto keep walls using Fiery Grip or its morphs. While you are within the walls of larger keeps (such as Fort Warden), the range of Fiery Grip and its morphs will be reduced. If the target of Fiery Grip is unable to be pulled to you for any reason, you will now be pulled to the target. Empowering Chains: This ability now grants you Empower for 5 seconds. Extended Chains' cost reduction and range increase effect is now a baseline effect for Fiery Grip. Empowering Chains morph: This morph will now always pull you to the target instead of pulling the target to you. It will continue to grant the Major Empower buff after being pulled as a morph effect. This morph will now refund 100% of the ability's cost as Magicka if it fails to pull a target. Switched the position of this ability with the Lava Whip ability as seen in the skill line UI. Increased the duration of the Major Expedition buff granted by this ability and its morphs to 6 seconds from 2 seconds. This ability and its morphs can no longer be dodged. Reduced the cost of this ability and its morphs by approximately 7%. Unrelenting Grip: Fixed an issue where this morph would not refund the ability's cost if it failed to pull in a target due to them blocking the attack. Empowering Chains: This morph now grants you 2 stacks of the Empower buff, up from 1. This ability now grants Major Expedition for a maximum of 4 seconds instead of 6 seconds. In regards to movement speed, we want there to be variability in the positive and negative directions during combat. In Update 19, we adjusted snares down to a 4 second duration so an optimal damage rotation wouldn’t include 100% up time on snares. In this update, we are adjusting Major Expedition buffs to be in line with the snare durations.